UNITED NATIONS, Dec 20 2006 (IPS) - When Kofi Annan leaves the United Nations next week after an eventful 10-year tenure as secretary-general, there will be one prized possession he says he will virtually hand-carry: the Inter Press Service (IPS) International Achievement Award 2006. “After 10 exhilarating years as secretary-general, it is humbling to be recognised for doing what you love to do,” he told a gathering of nearly 300 U.N. staffers, ambassadors and representatives of non-governmental organisations (NGOs) at the annual IPS award ceremony held at the U.N. delegate’s dining room Tuesday. 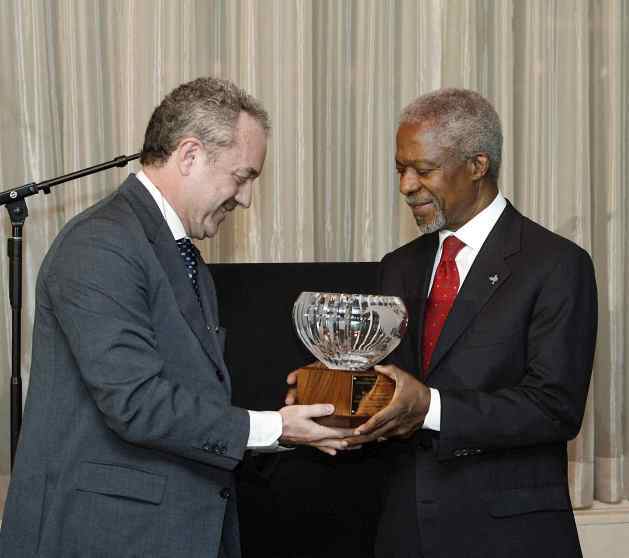 Mario Lubetkin (left), Director General of IPS News Agency, presents Secretary-General Kofi Annan with Inter Press Service International Achievement Award 2006, for his lasting contributions to peace, security, development, gender empowerment and human rights, at the annual IPS award ceremony, at the UN Headquarters in New York. "As secretary-general of the United Nations, as a Ghanaian and as an African, I have always appreciated your reporting. Your coverage of the United Nations and my career here began at essentially the same time. Ever since, you have reported on the United Nations with a uniquely developing world perspective, and you have allowed us to hear, and to be heard by, many of the people to whom the United Nations matters most." “I am truly honoured by this award, especially as it comes from members of the world’s press corps. Yet it feels right to conclude with one final farewell to you, my friends and sparring partners in the press: You have kept me on my toes and sometimes in the throes over all these years,” he added. Both the United Nations and Annan won the Nobel Peace Prize back in 2001, one of the highest accolades he had received during his career as secretary-general. Annan rose from the middle ranks of the U.N. system to its upper echelons over a period of 44 years – first, as assistant secretary-general, then as under-secretary-general, and finally secretary-general. “I am convinced that I could not have attained even half of what this IPS International Achievement Award ascribes to me if it weren’t for the power of the press, and organisations like IPS in particular, to convey not only the U.N.’s exhaustively documented shortcomings, but also report on the organisation’s invaluable and transformative work,” he said. Taking a dig at the some of the newspapers in the mainstream media, and particularly the neo-conservative Fox News U.S. TV network – which have occasionally conducted a virtual political vendetta against him – Annan said: “Of course, not all press is created equal. It is no mere coincidence that I am receiving the IPS Achievement Award and not, say, the FOX and Friends Award.” His remarks were greeted with laughter and cheers. Lubetkin said the IPS Board of Directors had decided last July to give its 2006 award to Annan for his lasting contributions to peace, security, development, gender empowerment and human rights. He said IPS, a 42-year-old news agency which has promoted the cause of developing nations, also recognises the commitment by Annan to help the world’s poorer nations in their fight to reduce extreme poverty and hunger, prevent the spread of HIV/AIDS and battle environmental degradation – as envisaged in the U.N.’s Millennium Development Goals (MDGs). IPS has followed both Annan’s and the U.N.’s achievements and reported them over these years, through its vast network of more than 350 journalists in 150 countries and in 22 different languages, Lubetkin said. “Today, we honour Mr. Annan’s outstanding leadership in the pursuit of the very mission for which the United Nations was created in 1945: a world seeking global peace, political stability, recognition of human dignity and the pursuit of human development,” he said. As a news agency with a similar vision of the future, Lubetkin said IPS considers it imperative to recognise the personal commitment of Kofi Annan towards the advancement of the concerns of the world’s poorer nations in their fight against poverty and hunger, and their battle against the spread of HIV/AIDS. His promotion of gender empowerment addresses a key issue of societal development and the attainment of larger freedom for all, Lubetkin added. He also pointed out that Annan gave more than two-thirds of his life to serve the United Nations, which continues to embody the hopes and aspirations of over six billion people in the world today. “Over the past 42 years since its creation, IPS has gained broad recognition as a global news agency which has made a valuable contribution to the understanding of the United Nations and its global mission – and also of the constantly evolving challenges in developing countries,” Lubetkin noted. “We are confident that Mr. Annan’s services to humankind will not end on Dec. 31. We hope we will have the opportunity to provide him with the information and communication element he will need in projecting his future vision to the people of the world,” he added. “I believe that in honouring Kofi Annan with the International Achievement Award for 2006, IPS may have finally honoured one who not only personalises the vision of its founders but perhaps is one of its most deserving recipients,” said Ambassador Kumalo who is also chairman of the 132-member Group of 77, the largest single bloc of developing nations at the U.N. The South African envoy said the stories of the developing world are not easy to tell. They are complex and do not lend themselves to easy headlines. But IPS has been telling the story remarkably well since its founding 42 years ago. Ambassador Kumalo said the lack of technology and resources in the developing world has been successfully exploited as an advantage by the developed countries that have relied on their global media companies to tell their side of the story. “Even our own capitals are reduced to learning about issues being debated in the United Nations from the perspective of the international media companies of the developed world that are often used to set the agenda at the United Nations,” he said. “It has therefore been helpful and even refreshing that Kofi Annan was available to tell the other side of the global story that often was not in line with the accepted international consensus carefully cultivated by the major powers using their international media companies,” the G77 chair added. Past recipients of the IPS award, which was established in 1985, include Gracha Machel, former First Lady of South Africa (1998); Danielle Mitterrand, former First Lady of France (1991); Boutros Boutros-Ghali, former U.N. Secretary-General (1996); Martti Ahtisaari, former President of Finland (1994) and the Global Call to Action Against Poverty (2004).